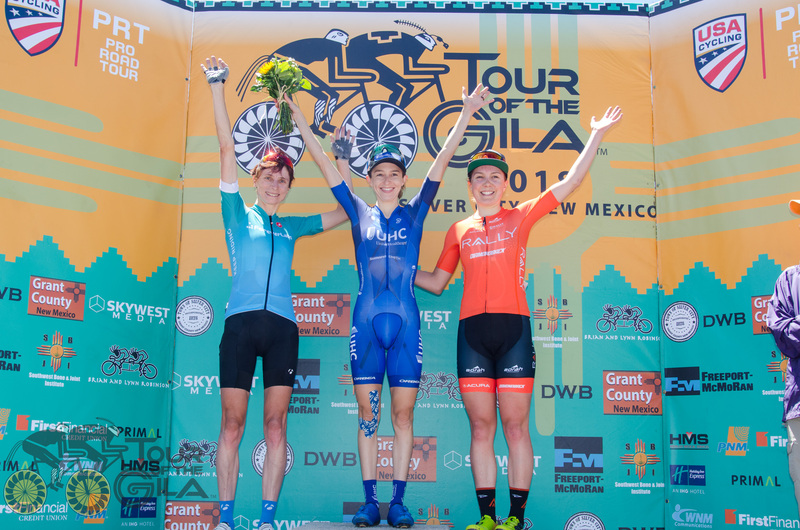 The 32nd annual Tour of the Gila began Wednesday with the return of the hill top finish on Mogollon. Canel's Specialized Oscar Sanchez shattered the breakaway with a strong solo attack in the final kilometres that only Rob Britton (Rally Cycling) who finished second, could follow. A surprise finish for third place by Alex Evans (Mobius Bridgewaylane) rounded the podium. "This win is very important for me because I arrived here with very little racing form," Sanchez said. "For my first race of the season, racing against teams that already have various competitions that they've done and have better form, for me is something that gives me confidence for what lies ahead in this race. I feel strong and I have a team that's behind me 100%." The day began with Canel's Ignacio "Nacho" Prado attacking out of the field shortly after the start at kilometre zero. Prado quickly gained a minute lead, that would soon expand to 5 minutes. The National Time Trial Champion of Mexico settled into a solo break that would last over 60 miles of the stage before getting caught. A two-man chase group includied Michael Hernandez (Aevolo) and Carlos Brenes (Costa Rica) chased for most of the day, by the time they caught Prado, team orders forced them to sit up and return to the field. 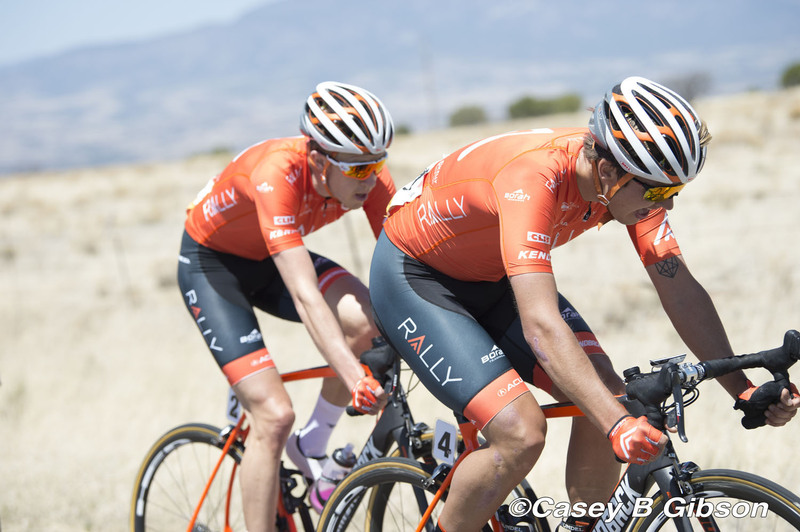 Returning champs, Rally Cycling, were left to drive the peloton, helping to set up Britton for the finishing climb. "We weren't going to get any help from anyone else so we just took the bull by the horns," Britton said. "It's what we're good at. I was going as hard as I could go. I had Adam (de Vos) riding the whole plateau pretty much full gas. He did a lot of damage which was perfect to set me up with the best position possible. I decided to go once we hit the climb and never looked back." Other Canadian finishers in the top 20 included James Piccoli (Elevate-KHS) in 5th at 1:36 back, Nickolas Zukowsky (Silber Pro Cycling) 11th at 2:03 back and Jack Burke (Jelly Belly p/b Maxxis) 15th at 2:22 back. 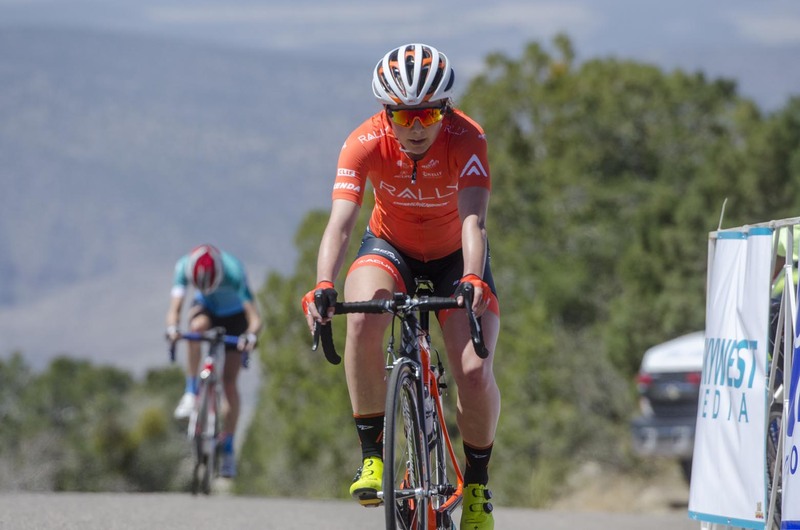 Shortly before the men's finish, Katie Hall (UnitedHealthcare) continued her winning streak at Joe Martin with a victory atop Mogollon for stage 1. Sara Poidevin (Rally Cycling) finishing 8 seconds behind. Edwige Pitel of QCW Cycling finished third. "I feel I'm on form right now and it feels really good," Hall said. "I felt pretty bad going up that last climb because we were crawling for a long time and that always makes me feel bad. You don't put out a lot of power so you just get tired. I felt terrible, but probably so did everyone else so I had to give it a try. It was a success." The race saw calm winds for the first time in years for Stage 1, which helped keep the field together for the majority of the day. UnitedHealthcare Pro Cycling and Rally Cycling took over once the race made the last turn heading into the climb for the finish. Poidevin now leads the Best Young Rider classification, happy to return to the Gila after missing last year's edition due to injury. "I'm really excited to race Gila," Poidevin said. "I was really bummed to miss out on it last year. We have a strong team here." Other Canadian finishers in the top 20 included Jasmin Duehring (Sho - Air TWENTY20) 7th at 1:54 back, and Kirsti Lay (Rally Cycling) 12th at 2:32. Results from the first stage of the Tour of the Gila in Silver City, New Mexico. 6 Diana Penuela (Col) UnitedHealthcare Pro Cycling Womens Team s.t. 9 Ariadna Gutierrez (Mex) Conade-Specialized s.t. 12 Kirsti Lay (Can) Rally Cycling Women s.t. 14 Jennifer Luebke (USA) Hagens Berman / Supermint Pro Cycling Team 2.2. 18 Andrea Ramirez (Mex) Swapit Agolico both s.t. 22 Heidi Franz (USA) Rally Cycling Women s.t. 24 Shayna Powless (USA) Sho - Air TWENTY20 s.t. 36 Liza Rachetto (USA) Hagens Berman / Supermint Pro Cycling Team s.t. 43 Valentina Scandolara (Ita) s.t. 49 Jannie Milena Salcedo (COl) both s.t. 51 Emily Rodger (Can) s.t. 17 Eder Frayre Moctezuma (Mex) Elevate-KHS s.t. 20 Jonathan Clarke (Aus) UnitedHealthcare Pro Cycling s.t. 24 Jordan Cheyne (Can) Elevate-KHS both s.t. 27 Danny Pate (USA) Rally Cycling s.t. 32 Fernando Islas Lopez (Mex) Aevolo s.t. 34 Marc-Antoine Nadon (Can) H&R Block Pro s.t. 38 Christopher Blevins (USA) Hagens Berman Axeon s.t. 44 Ethan Berends (Aus) Mobius Bridgelane s.t. 56 Brian Sanchez (CRc) Team Costa Rica s.t. 64 Bernat Font Mas (Esp) 303 Project s.t. 69 Oliver Evans (Can) H&R Block Pro s.t. 72 Spencer Downing (USA) Gateway-Harley Davidson both s.t. 85 Oliver Flautt (USA) Cyclus Sports all s.t. 90 Lukas Conly (Can) Support Clean Sport/Guttenplan Coaching both s.t. 93 Pier Andre Cote (Can) Silber Pro Cycling s.t. 95 Miguel Antonio Santillanes (Mex) Support Clean Sport/Guttenplan Coaching s.t. 100 Alistair Donohoe (Aus) Mobius Bridgelane s.t. 103 Ricky Randall (USA) Cyclus Sports s.t. 112 Anthony Fitch (USA) Pacific Premier Bank all s.t. 115 Conor O'Brien (Can) H&R Block Pro s.t.